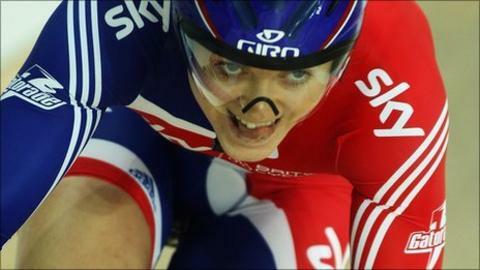 World team sprint silver medallist Jess Varnish won the 500m time trial title on day one of the British National Track Championships in Manchester. Varnish, 20, set a lifetime best of 34.5 seconds to beat a fine early time from world team pursuit champion Laura Trott, with Becky James in second. Olympic bronze medallist Steven Burke won the open pursuit title in three minutes 59.758 seconds. Jon Allen Butterworth set a new world best of 1.07.459 for the MC5 category. Varnish and Victoria Pendleton just missed out on world team sprint gold as Australian Anna Meares won her third straight world championship title in the Netherlands in March.